Measure the circumference of the bottle; add 1" for seam allowance and ease. Measure the height to the top of the cap; add 2" so you can make a casing at the top and a hem at the bottom. Trim fabric to size. Also cut small rectangles of fabric for the sleeves approximately 3" x 6" depending on the height of the bottle. 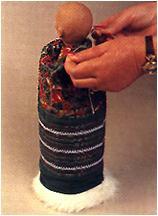 Sleeves, with hands attached, should be approximately half the height of the bottle. For sample #2 place the Sulky Heat-Away Stabilizer to the wrong side of the gown fabric. Using a chalk or vanishing marker, draw parallel spaced lines to use as stitching guides. Stitch rows of decorative stitching using a twin needle. Try centering one of the large Christmas decorative design patterns available on many top model electronic machines. For a brilliantly glittery look, use Sulky Sliver Metallic, or if you prefer a more filled-in, shiny look, use the heavier Sulky 30 wt. Rayon. To softly quilt a Christmas Print, set up the machine for Free-Motion Embroidery: Lower feed dogs or cover them. Lower top tension slightly. Remove the regular presser foot and replace it with a darning foot or darning spring. Reduce the top presser foot pressure, if your machine can be adjusted. Thread top with Sulky Sliver or Sulky Original Metallic; use an Embroidery Needle size 14/90. Thread bobbin with a matching color of 40 wt. Sulky Rayon or regular sewing thread to match the background fabric color. Set the machine for a straight stitch. Layer your Fabric (in this example): bottom Layer Ð muslin, middle layer - low loft batting, top layer Ð Poinsettia Print (right side up). Place the fabric in a large machine embroidery hoop with the muslin layer flat against the bed of the machine. This will ease the stress of holding the fabric smooth with just your hands. If a hoop is not available, simply pin layers together at corners and move the fabric slowly while running the machine at an even, moderate speed. Follow the outline of the print. Sample #1: If you elect to use a plaid, to embellish, simply keep machine set up for regular sewing and select a decorative stitch like the icicle stitch, feather stitch or multi-Once the decorative stitches are completed, remove the Heat-Away Stabilizer by simply pressing with a dry iron at a Cotton Setting for 10 seconds (see package instructions). When stabilizer turns brown, just brush it away. This way you did not exert any stress against your decorative stitches while removing the stabilizer, and delicate straight stitches were not pulled out. straight stitch used above. The lines that make up the plaid serve as perfect guide lines for stitching. If you used two different fabrics, sew them together. Add fake fur to bottom of gown. Cut a strip 4" by width needed for your bottle. Fold strip in half lengthwise, place raw edge to raw edge of gown and stitch together. Sew sleeves and turn to right side (finished sleeve should be approximately 1 1/2" wide). Place hand inside bottom of sleeve with thumb up and hot glue it on. Hot glue strip of fake fur (1 1/2" wide) around wrist. Make a casing at other end of gown. Thread string through casing. Place over bottle. Tie and knot string to Santa's Head along the neck ridge. 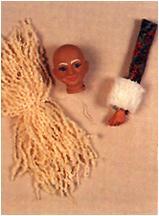 Bundle a generous length of bumpy natural yarn (or whatever yarn you prefer) and tie a knot in center with string. Tie securely around Santa's neck. 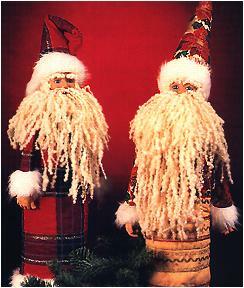 Take a few strands of yarn and glue them under Santa's nose. If desired, glue one small cut piece over each eyebrow. The hat is a 10 1/2" equilateral triangle cut from quilted poinsettia fabric. Finish your Santa by sewing the right sides of the hat together. Turn out. Glue to head. Glue a band of fake fur approximately 1 1/2" wide around raw edge of hat. If desired, add a few strands of yarn along forehead next to hat brim. Note: In selecting your bottle of beverage for the party, dinner or gift, the 1 QT. plastic soft drink bottles are always an appropriate selection. ENJOY!